Below there is a real time board with information of traffic. With blue text marked the arrivals, with black the departures and with red text are the real time data and corrections of schedules, provided by several observers. Finally executed flights (after landing/take-off) usually appears with light grey italic text. In case of diversion (usually due weather) the flight row is highlighted yellow until verification of intentions of the flight. Arrive later back to Skiathos or cancel at all. When information is received the yellow row is out unless flight is canceled. Here is an image with those color decode. See this image for more. If you like to join the team of realtime feed please e-mail us with the relevant request in order to give you access. This table is automatically refreshed every 30 seconds. However due possible compatibility problems with a device we suggest you to manually refresh the page. Main purpose of Flight Board on our website is to inform the visitors passing through finals when there is inbound flight. Many people, even if they don’t know in advance how a landing in Skiathos runway 02 looks like, when driving close to the seaside road stop till next landing. Because we don’t have Heathrow traffic (unfortunately) sometimes people has to wait for hours. That demand create the idea of Flight Board. After realtime board there is the weekly flight schedule of Skiathos airport. ENJOY THE LANDINGS AT SKIATHOS WITH SAFETY!!!! Weekly Flight Schedule of Skiathos (Version 2017.02) can be found HERE. 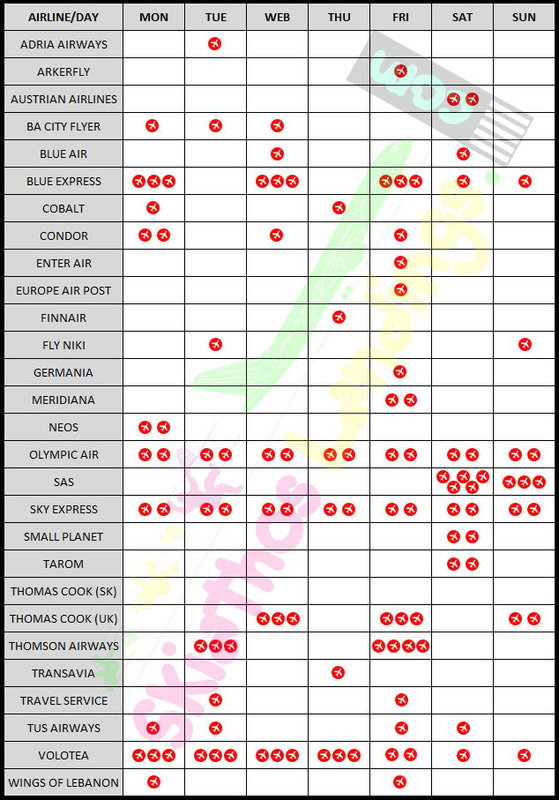 Archive Flight schedule Summer 2016 by Airline/Weekly flights can be found HERE. Flight schedules from the past can be found on TRAFFIC STATISTICS section.